Every season, more and more players from different countries pack their bags and lace their skates to play in the NHL. What once was a sport that was heavily saturated with Canadians, is now a league filled with players from around the world. In 2017-18, Canadians made up 45.3% of the league; the third consecutive year where other nationalities combined to outnumber Canadians. As the sport of hockey globally grows, the league should see more diversity in its players, making the chances of a single country majority that much more rare. A total of 445 Canadians played at least one regular season game in 2017-18. They combined for a total of 3,303 goals and 5,733 assists, good for 9,036 points. Meanwhile, the rest of the league combined for 4,138 goals and 6,873 assists for a total of 11,011 points. In total, Canadian scoring made up 45.1% of all points scored league-wide. Fittingly, a large majority of the points were scored by Canadian-born players. Yet, a few American- and a couple of European-born players made their mark for Canada too, choosing to represent Canada in international play—thus adding to Canada’s totals. To see where all of these points came from, all goals and assists by Canadian players were plotted based on their birthplaces. Goals are plotted in red, assists in blue, and size represents the number of goals or assists scored. Unsurprisingly, the highest density of points scored were by players born in Ontario, with some regions so saturated with players that transparency was completely lost, especially near the Greater Toronto Area. Lost somewhere in the masses was Connor McDavid from Richmond, who registered 41 goals and 67 assists. McDavid was one goal behind Eric Staal, who scored 42 goals and 34 assists coming out of Thunder Bay. Similarly, McDavid was one assist behind Claude Giroux of Hearst, who scored 34 goals and 68 assists. Outside of Ontario, a lot of NHL players come from Western Canada, whose birthplaces are completely scattered across the prairies to the west coast. Leading the way in scoring was Hart Trophy winner Taylor Hall, coming out of Calgary with 39 goals and 54 assists for 93 points. He led Western Canada in goal scoring, but was bested by Calder Trophy winner Mathew Barzal for the most assists. Barzal scored 22 goals and 63 assists during his rookie campaign. Going east to the Maritimes, Nathan MacKinnon bested his peers, scoring 39 goals and 58 assists for 97 points. No other Maritimer scored more goals than MacKinnon, but Sidney Crosby picked up two more assists, tallying a total of 29 goals and 60 assists last season. In case over-laying both goals and assists together were a bit too much, they’re separated here for easy perusal. Again, goals are red and assists are blue. The top ten Canadian scoring leaders are dispersed across the country. The aforementioned players are joined by Steven Stamkos of Markham, Brad Marchand of Halifax, John Tavares of Mississauga, and Jamie Benn of Victoria. When compared against the rest of the league, Canadians account for 10 of the top 22 scoring leaders. McDavid and Giroux took the #1 and #2 spots in the 2017-18 NHL scoring race, accompanied by MacKinnon at #5, Hall at #6, and Crosby at #10. Stamkos, Marchand, and Barzal slotted in at #12, #13, and #14, and Tavares and Benn were good for #16 and #22. Not bad at all for Canada’s best. Some players born outside of Canada still chose to represent the true north. Nine players come from the USA: Sean Couturier, Josh Manson, Tyler Myers, Brandon Sutter, Marcus Foligno, Adam Lowry, Jakob Chychrun, Kerby Rychel, and Brendan Lemieux. Coming from Europe are Brendan Perlini who was born in the UK and Xavier Ouellet who was born in France. While not a skater, an honourable mention goes to former Calgary Flame goaltender Danny Taylor (his only NHL win came while he was a Flame, back in 2012-13). This past season he dressed for one game with the Ottawa Senators. Canada would have a few more players on the map if it weren’t for a handful of players opting to represent other nations. USA has the highest number of Canadian-born players. Paul Stastny, Jason Pominville, Cam Fowler, Taylor Chorney, Josh Archibald, Patrick Eaves, and Dominic Turgeon all play for Canada’s southern neighbour. The other country to have Canadian-born players representing its national team is Sweden. William Nylander, Alexander Steen, and Alexander Nylander don the tre kronor during international play. Related — RFA Roulette: Where will their contracts land? No matter how you look at it, a big part of Canadian identity still comes back to hockey. Players and spectators of the sport come from all parts of the country. From coast to coast to coast, Canadian hockey remains as strong as ever, even if the rest of the world is catching up. 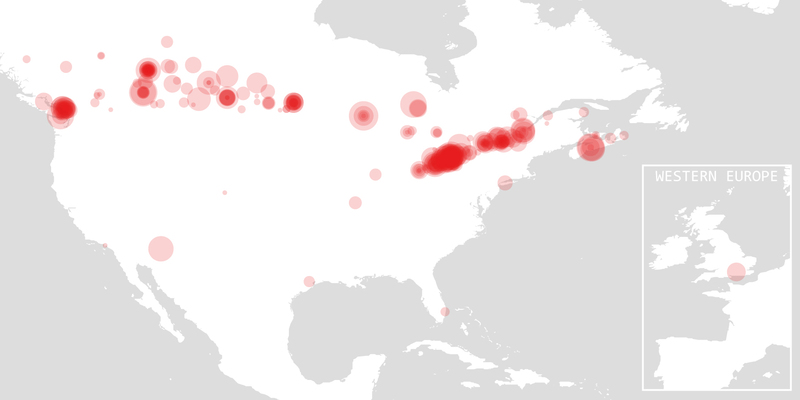 Does your favourite Canadian player come from a place you can pinpoint on a map? Which locations strike you as standouts? Let me know at @mrbilltran or @wincolumnblog. Active Canadian player data via quanthockey.com, birthplace data via hockey-reference.com, geographic data via Natural Resources Canada and GeoHack. Colour-blind safe palette adapted from ColorBrewer.